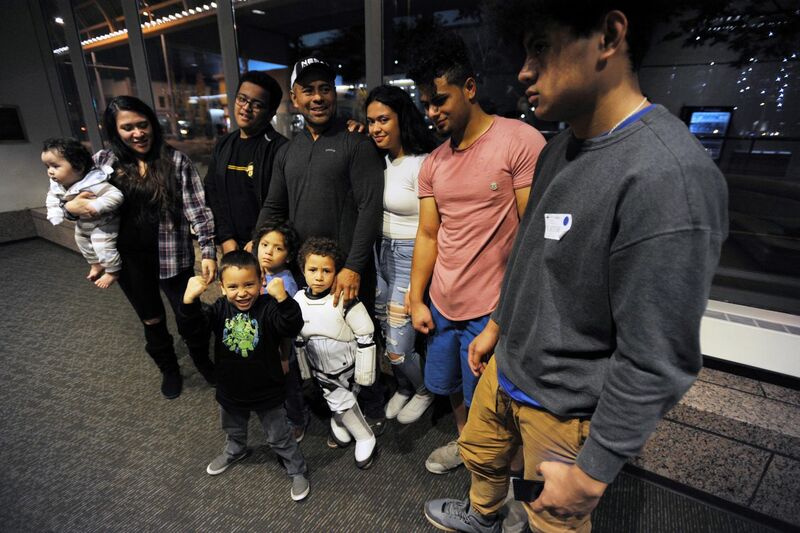 With four grandchildren in the audience, Simi Makihele returned to the ring last week for a heavyweight fight against a 32-year-old minister. 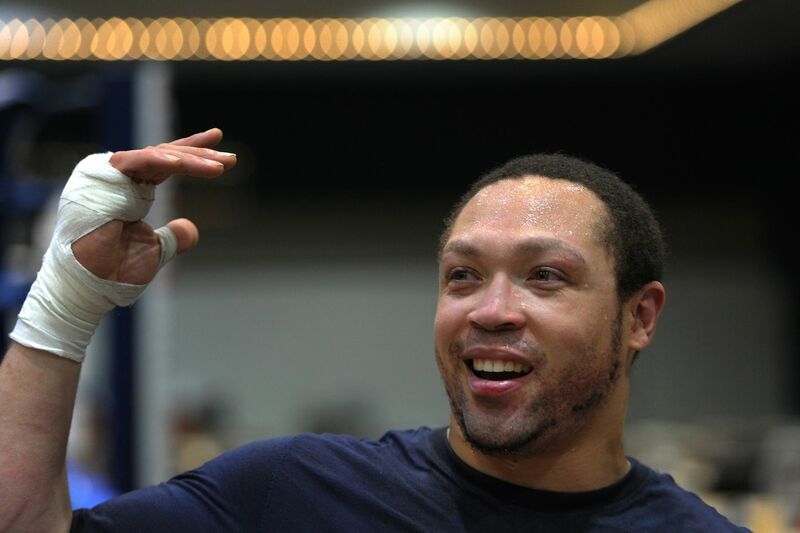 Simi Makihele returned to the boxing ring last week after a long hiatus from a career that once made him a regular force at Thursday Night at the Fights and nearly sent him to the Olympics. As he waited for the 201st fight of his life, he could easily recall his record — 191-9. But damned if he could remember the last time he ducked under the ropes and bumped fists with another fighter. He was sure of this much, though: He'd never before boxed with grandchildren watching. 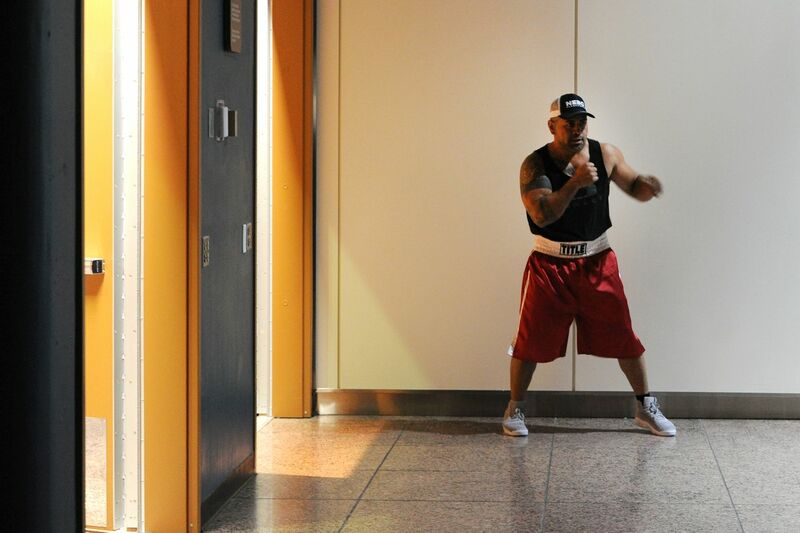 Makihele is 46 years old — he'll be hearing from AARP soon enough — and said he was egged back into the fight game by Jerry Miller, the matchmaker for Thursday's weekly fights at the Egan Center. "I got suckered into this by Jerry," he said. 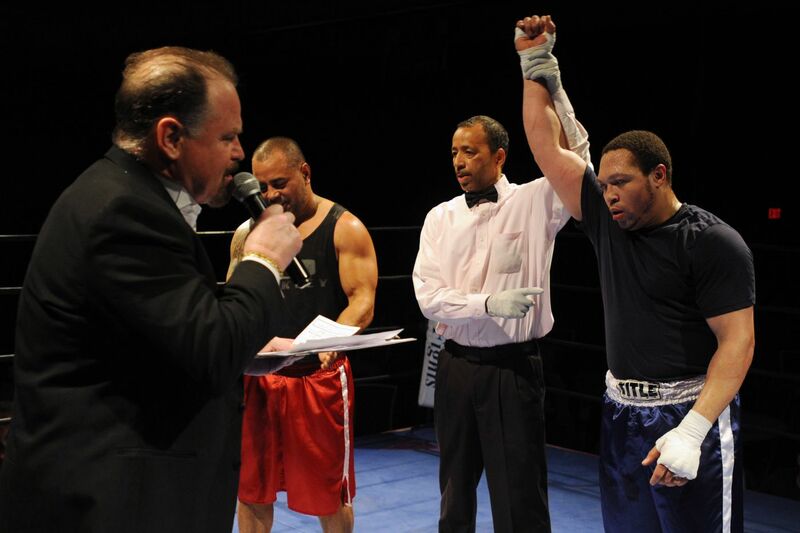 "I went to sign up my nephew for his first fight, and somehow he talked me into fighting." By luring Makihele, Miller got better than he bargained for. The 19-year-old scheduled to fight Makihele in the main event backed out after hearing about his opponent's reputation, and Miller replaced him with 32-year-old Cordero Gonzales, creating a battle of heavyweight champions. 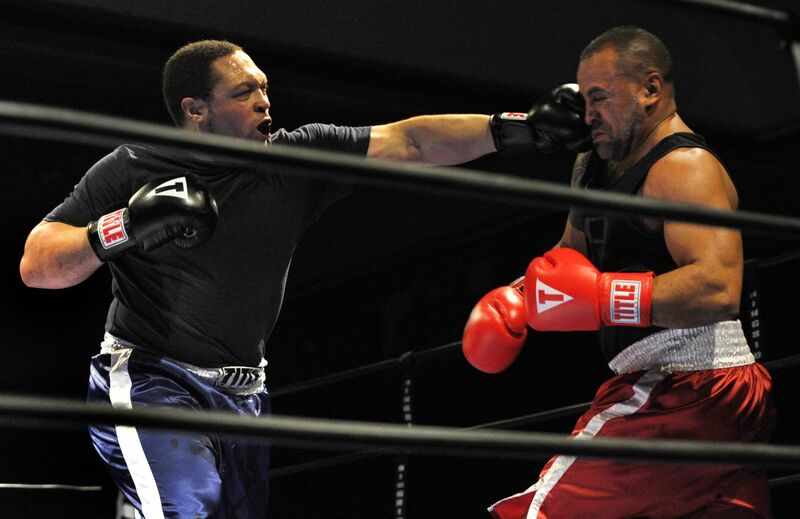 Makihele and Gonzales have both won multiple titles in Alaska amateur boxing, with Gonzales reigning as both a middleweight and a heavyweight. Their meeting last week was an early season marquee bout for Thursday Night at the Fights, which is celebrating its 30th anniversary this season. On hand were 10 members of Makihele's family, including four grandchildren ranging in age from 6 years to 7 months. Makihele looks young for 46 — and for someone who's had more than 200 fights. But a single day's notice gave him no time to train for his comeback, and especially no time to develop the endurance needed to survive three 90-second rounds of boxing. At 225 pounds, he was about 15 pounds heavier than his preferred fighting weight. "I'm not the same as I used to be. My knees aren't the same," Makihele said. "I'm not in shape. I own a roofing company so it keeps me in shape, but I usually train months in advance. I woulda run. I woulda trained a lot more. "Yesterday I did some shadow boxing and a little jogging." Makihele, who lives in Eagle River, came to the United States at age 6. He said his father, "Rocky" Uluaki Makihele, was a prizefighter who left Tonga in the 1970s with the hope of getting a fight with Sugar Ray Leonard. Although that fight never happened, the family stayed. Makihele was 9 when he had his first fight. By the mid-1990s he had moved to Anchorage to join a sister who raved to him about the fishing. He quickly became a big fish in Alaska's small pond of boxers, a top contender in Toughman contests and a frequent winner at the Thursday fights. In 2000, he captured the silver medal in heavyweight boxing at the Oceana Games, a result that made him an alternate on Tonga's boxing team for the Sydney Olympics. Makihele hung up his gloves several years ago. He still went to the fights and the weigh-ins every so often, and earlier this year he began training his 23-year-old nephew, Lui Ofiu, who won his debut on last week's undercard. He was with Ofiu at last Wednesday's weigh-ins when Miller goaded him into fighting again. Makihele's return thrilled Thursday Night at the Fights promoter Jim Patton, who hyped the Makihele-Gonzales bout as "the fight of the heavyweight champions." Gonzales, a Thursday night regular for many years, said he was surprised when Miller called him the day of the fight and asked him to take on Makihele. The two had fought once before, years earlier, in a meeting that Makihele won by decision. But boxers are never really done, Gonzales said with a knowing smile. "The fighter never dies inside you," he said. "It's the love of the sport. I love boxing. I love everything about it. "It's like chess. You can match wits. Even when you're beaten, you can take something home from it, because in life there are struggles, and in the ring you can bring all that out in the open." Gonzales is a cook at Snow City Cafe, which makes for a tough turnaround on fight nights. Last week's main event ended after 10 p.m. and was followed by the post-fight party at Koot's that fighters are expected to attend. He was due at work at 5 the next morning. He's also the father of seven, and he and his wife, Angel, are both ministers at Anchorage's River in the Desert Community Church. "What a great fight the Lord fought for us," Gonzales said, deftly illustrating how he brings boxing into the pulpit. Youth and cunning were on Gonzales' side in the fight against Makihele. Makihele looked good in the first round, landing a couple of body punches while Gonzales spent the round feeling out his opponent with a series of jabs, several of which missed. After that it was all Gonzales, who dominated the final two rounds against an obviously fatigued Makihele. Gonzales took a 29-29, 29-28, 30-28 unanimous decision to improve his record to 192-8-3. "I just couldn't answer," Makihele said. "My reaction is off. My timing is off." Makihele, who was embraced warmly by a crowd of several hundred, didn't get more than a few feet away from the ring before a spectator stopped him. The man was in the market for a new roof, and could Makihele come by and give him an estimate? And so life goes on for Makihele, who ends his fighting career with a 191-10 record and no noticeable injuries, scars or slurs of speech. This time, he said, he's done for good, even if it means going out with a loss. "I'm OK with it," he said.